Owen Ogletree's past ON TAP beer articles for Athens Magazine. This article originally published in Owen Ogletree's ON TAP beer column in Athens Magazine. We've all seen it. Someone takes a sip of bitter, hoppy ale, and a dreadful grimace follows. For many people just starting to explore the extensive world of craft beer, hoppy brews are often a challenge and an acquired taste. Brewers in the Middle Ages employed all sorts of herbs and spices to balance beer's barley malt sweetness, but when hops were first added to brewkettles, these early brewers noticed a pleasant floral aroma, spicy flavor and bitter aftertaste. Hops - climbing vines with fragrant flower cones full of spicy, sticky resins - have formed an integral ingredient of almost all beer recipes ever since. Following the exploding U.S. craft beer market in recent years, many beer aficionados have developed a mania for extremely hoppy beers. These self-proclaimed "hop-heads" encourage brewers to "push the envelope" in developing new brews packed with intense hop aromas, flavor and bitterness - often times, with increased malt and alcohol contents to back up the hop depth. For casual beer fans, full hop appreciation sometimes takes years of sipping and sampling. To aid in this worthy endeavor, descriptions follow of a few of the most memorable hop-dominated beers available in Georgia. Head to Athens' Copper Creek brewpub to sample brewer Matt Buley's delightful American Pale Ale. Matt adds citrusy, aromatic hops near the end of the boil to impart a pleasant, grapefruity nose and flavor. When served occasionally from a small, English cask placed directly on the bar, whole hop flowers are added directly to the cask, providing an even greater hop wallop. Terrapin's Hopsecutioner comes in as a 7.2% alcohol content India-style pale ale loaded with caramely malts and piney hops. Look for the distinctive bottle label with the "executioner" turtle and guillotine. Hops increase the shelf life of beer, and the India Pale Ale (IPA) style originated when 19th century English brewers formulated high alcohol, exceeding hoppy ales to withstand the long sea voyage to troops stationed in India. Pennsylvania's award-winning Victory Hop Devil IPA contains a powerful, aromatic whack of whole flower American hops, balanced by rich, toasty German malts. Effigies of mythical "hop devils" were once burned by European hop farmers to ensure a healthy harvest, and the Victory label sports a representation of this mischievous legend. Belgian brewer Hildegard van Ostaden visited a California beer conference a few years ago and fell in love with pungent American West Coast hops. Upon her return to Belgium, she formulated Urthel Hop-It - a fruity Belgian pale ale with big hop tones in aroma, flavor and bitterness. This hybrid style proved an instant, international success. Fans of Sweetwater 420 should also make the effort to sample Sweetwater IPA - the hoppiest beer in the thriving Atlanta microbrewery's portfolio. Expect a medium-bodied, dark golden ale loaded with pungent, earthy, citrus/pineapple hop overtones. California's Sierra Nevada Brewing Company invented the hoppy style of American pale ale back in 1980. The brewery's new Torpedo Extra IPA, reddish/gold in color with 7.2% alcohol, contains assertive hop flavor and bitterness highlighted by pine, citrus and herbal hop notes. 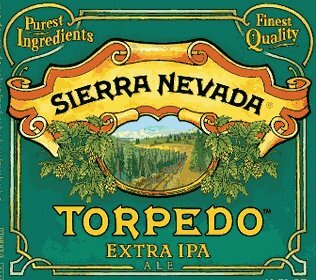 The name comes from a dry-hopping device called the “hop torpedo” that was designed by Sierra Nevada to impart the perfect hop character to their brawny IPA. Peak Organic IPA comes from a Maine microbrewery dedicated to using only sustainable, organic ingredients. Peak brewer Jon Cadoux started homebrewing back in the early 1990s and often included ingredients from local, organic farmers in his beers. When organic hops became readily available several years ago, Jon developed his flavorful and aromatic IPA - now one of the brewery's best sellers. After years of customer requests for a hoppy brew, Colorado's New Belgium Brewing Company - best known for their popular Fat Tire Ale - joined the hop bandwagon recently with their Ranger IPA. Brewed with pale and dark caramel malts that harmonize the citrusy, fruity hop profile, Ranger IPA makes for an extremely drinkable, hop-driven selection. Dogfish Head boasts a successful Delaware brewpub and microbrewery. Owner Sam Calagione, considered a beer "rock star" by many, invented a gadget that adds a continuous stream of condensed hop pellets over the entire course of a 90 minute boil during the brewing process. The resulting ale, called 90-Minute IPA, embodies an extremely elegant and complex hop character, backed by light, fruity, honey-like malt notes. If 90-Minute IPA seems too intense, try the more restrained 60-Minute version. Rogue Ale's jet-black Shakespeare Stout hails from Newport, Oregon and offers full-bodied flavors of dark, roasted, espresso-like malts backed by surprisingly extreme hop flavor and bitterness. Rogue has pioneered personable, hop-centered American craft beers since 1988, and Shakespeare ranks as one of the most unique and memorable stouts on the market. Central California's welcoming Moylan's Brewery & Restaurant serves up more than just yummy chili and pizzas. The brewers run a small bottling line and ship their house beers to outlets as far as Georgia. Moylan's most acclaimed brew is Hopsickle IPA - a 9.2% "imperial" IPA bursting with sweet caramel malts and a mouthful of intense hop gusto. The extra malt makes an appropriate backdrop for the colossal hop profile. Not for the faint of heart!